User requests web page (1). ComSifter checks internal cache for page. If locally cached, ComSifter responds to request immediately (6). 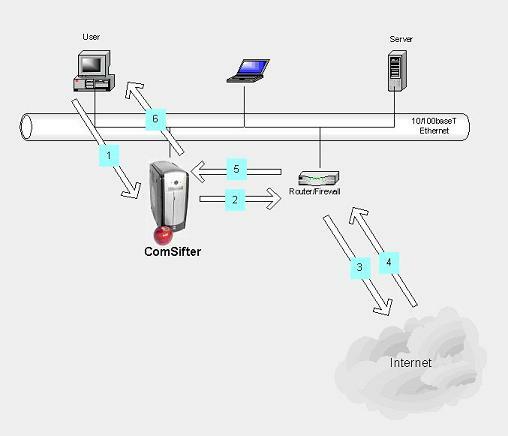 If not locally cached ComSifter requests page from Internet by way of Router/Firewall (2). Request for page is sent to Internet (3). Request is received from Internet (4). Returned page is routed to ComSifter (5). If clean ComSifter serves page to end user (6). If not clean ComSifter sends "Access Denied" page (6).